Who doesn’t love green food? Oh, yeah, toddlers. Well, except mine who things it needs to be green to be edible! 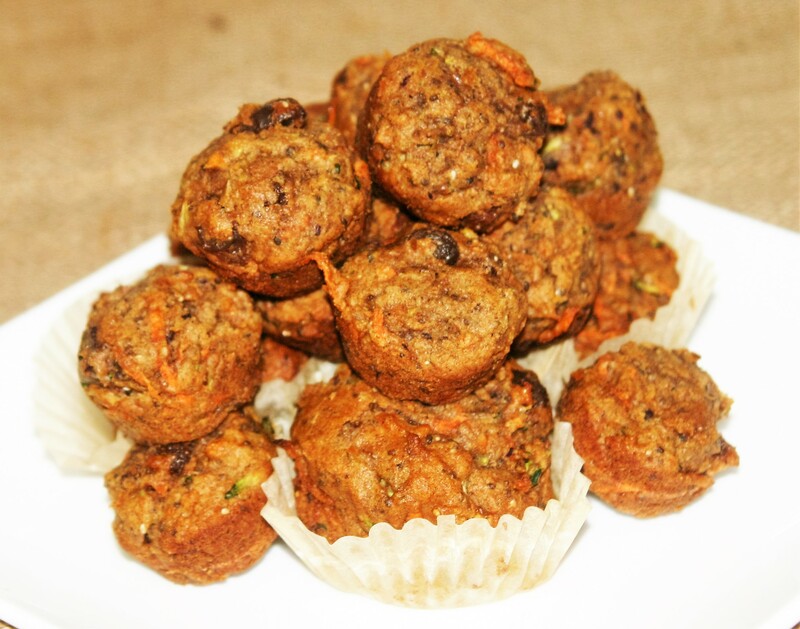 These yummy muffins are packed with vegetables, take their sweetness from the dates, and are good enough I was sneaking them when my daughter wasn’t looking. These are quite green from all the vegetables and would be perfect to introduce on St. Patrick’s Day if you have a picky eater. Also perfect to bring to work to nourish you throughout the day to prepare you for your evening activities. Spread a little almond butter on these and you have yourself a meal. 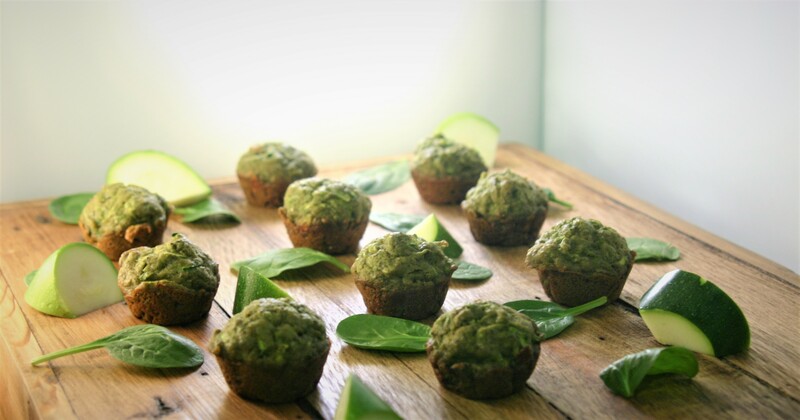 Preheat oven to 350 and prepare a muffin pan with paper liners or by lightly oiling the pan. Place chopped dates in a glass measuring cup, pour boiling water over the top just to cover the dates, and set aside to soften, about 5 minutes. In a mixing bowl combine all of the dry ingredients, flour through cinnamon. When dates are soft place them, the soaking water, coconut oil, and the baby spinach in a blender or food processor and blend until smooth. Pour date mixture into bowl with dry ingredients, add chia seeds, zucchini, and vanilla stirring to combine. Divide the batter evenly into prepared muffin tine and bake 18-20 minutes until tops turn golden brown and a toothpick inserted in the center of one comes out clean. Remove from the pan and allow to cool a bit before eating. My daughter loves muffins, well, she loves glorious morning muffins, and I wanted blueberry muffins. I am refraining from giving her any refined sugar for as long as possible, so I needed to develop a recipe for blueberry muffins that would make everyone happy. Light and fluffy for me, and fairly healthy for her. These are a good balance. The dates give them plenty of sweetness, that combination of flours keep them light, with just enough whole wheat I didn’t feel too terrible. 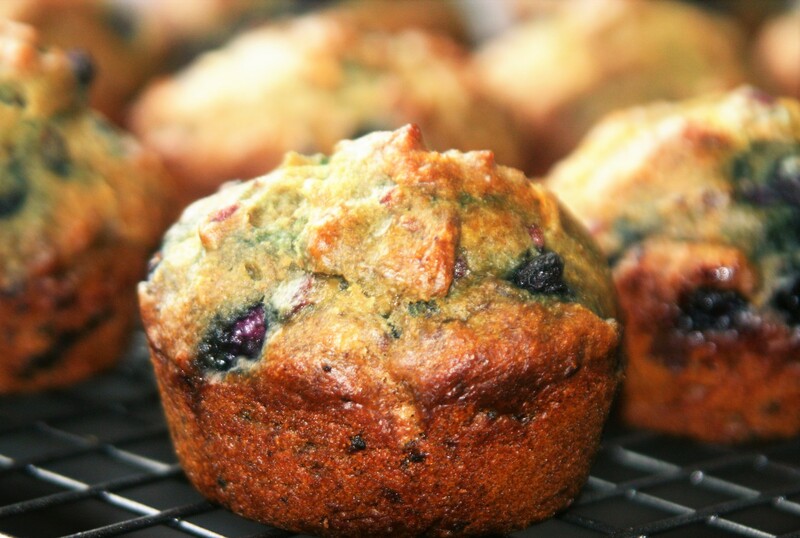 The lemon zest gives the muffins a hint of spring and they are bursting with blueberries. I highly recommend these for second breakfast on the go. 1 1/2 cups, pitted, chopped dates. Place the chopped dates in a heatproof bowl or measuring cup and pour the boiling water over the dates. Cover and set aside until soft, 10-20 minutes. Combine the flour, baking powder, baking soda, and salt in a large bowl stirring briefly. When the dates are soft mash them with a fork until relatively smooth (no big pieces), then add them to the flour mixture. Add the lemon zest, sunflower oil, non-dairy milk, vinegar, vanilla, and almond stirring to combine. Add the blueberries and stir to distribute evenly throughout the batter. Divide batter evenly into 12 muffin cups and bake 20-24 minutes until golden brown and a toothpick inserted in the center of a muffin comes out clean. Allow to cool at least 10 minutes before eating.